Nothing says boring like a predictable, conventional (a nice way of saying slow and dull) introduction to a presentation or speech. Ramping it up just a couple of notches with some creativity can make all the difference. And, in some cases, going from mild to wild with your imagination fires up your audience. Imaginative, unexpected approaches to starting a presentation are eagerly welcomed by an audience weary of typical talks. The audience appreciates an entertaining, yet professional and relevant, presentation that sets you far apart and above the crowd. Famous comedian and late-night television host Johnny Carson profoundly said, “People will pay more to be entertained than educated.” Do both! You may be a bit hesitant to attempt something different and untried because you risk the audience not accepting it. The fact is groups love interesting, enjoyable presentations that display meaningful creativity and captivate and rivet their attention. What are you waiting for? When it comes to being creative in your presentations, and particularly the introductions, your comfort level limits you far more than your imagination. The more you experiment in small ways, the more you feel confident and assured in your ability to successfully apply your imagination. Professional creativity that is neither silly nor lessens your credibility grabs the audience’s attention when you begin your talk. Start out with milder forms of clever ideas, test them, and then move up the creativity ladder as you become more confident and comfortable with your blossoming communication imagination. This atypical introduction immediately begins with something of obvious value to a potential customer, without a long-winded buildup, a transition, or wasted time. These two presenters raised eyebrows right away and snatched their group’s attention from a 30-second, bottom-line oriented video. The CEO of a small, innovative software company is one of the key speakers at a business conference. The person who just verbally introduced him walks to the extreme side of the stage, where the speaker has been standing unseen by the audience. He walks the speaker by his arm very slowly and carefully toward the lectern and the audience sees that the speaker is blindfolded. As he takes off the blindfold, he smiles and puts up his first slide of a person successfully reading an eye chart for 20/20 vision. The director of innovation for one highly effective government agency (yes, it is possible!) was asked to give a presentation to another large, bureaucratic agency that struggles with inefficiencies and waste, which prevent it from meeting aggressive goals set by the administration. After being introduced, she starts in a most unique and unexpected fashion by saying, “Let me tell you a story.” She recounts the compelling, captivating tale of three organizations that struggled with essentially the same types of problems that burden this agency. Like a mini-epic, the five-minute story mixes facts and statistics with the personal struggles and emotional highs and lows of the managers who ultimately overcame the obstacles and changed the operations and culture of their organizations. The presenter tells a story each person in the audience relates to and understands. She mesmerizes the group, but stops short of telling how the story ends to build anticipation and curiosity. The regional sales vice president for a leading customer relationship management (CRM) application company puts on a public seminar in a hotel and invites sales executives and sales managers from dozens of small to large companies. 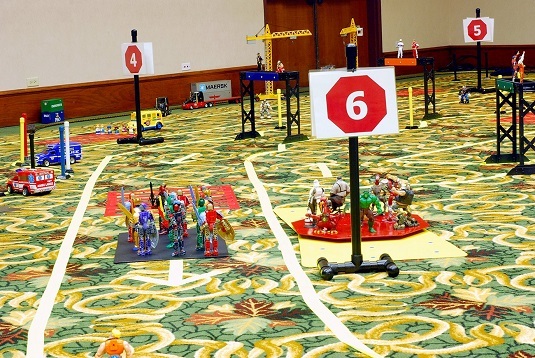 As attendees walk into the meeting room, they find not the expected rows of chairs and a projection screen but an obstacle course laid out on the floor. Yellow duct tape defines the course interrupted by paper building blocks, signs, plastic figurines, model buildings, and a metal bridge. A large remote-controlled car waits at the start of the obstacle course. Needless to say, this unexpected display intrigues the attendees. An unexpected and entertaining demonstration grabs the audience’s interest. When everyone gathers in the room, the vice president says, “Welcome to our seminar! As sales professionals, you know how difficult it can be to navigate the accounts with which you want to do lots of business. You meet gatekeepers, people change jobs, and competitors want to gain an edge over you. Right?” People nod their heads in agreement. The VP introduces a young man holding the remote control, and then shouts, “Go!” With that, the fellow drives the car and knocks down the paper blocks that form temporary barriers on the road, navigates over the bridge, steers around the plastic figures of people representing gatekeepers, and passes the finish line in such a quick, masterful way that those in the audience are awestruck with his expert driving.